Are you thinking about buying an electric fireplace for your home? Electric fireplaces enjoy many advantages over traditional wood and gas-burning fireplaces. They don’t consume fuel, they don’t produce smoke, they use less energy and they can produce a wide variety of visual effects. Problem is, there are so many brands and types of electric fireplaces for sale these days – and prices are all over the map. 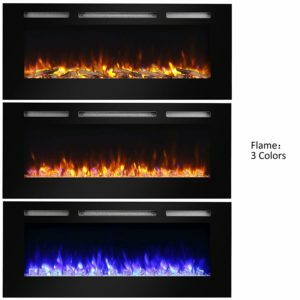 Finding the best electric fireplace for your home, your style and your unique installation requirement can be quite challenging. 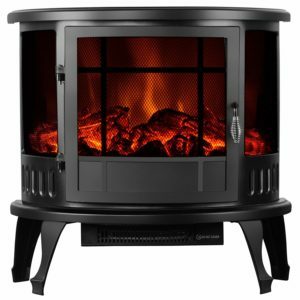 In this in-depth buying guide, I’ll review the best electric fireplaces you can buy online in 5 different categories. Whether you need an electric fireplace for a new home or a remodeling project, I’ll help you find the best one for your needs and budget. I’ll also give you some tips on how to choose the best electric fireplace, how to install it yourself and how to maintain it (hint: they require almost no maintenance). I’ve grouped my 15 top picks into five categories to make it easier for you to find what you are looking for. All of the units reviewed on this page can be purchased online and shipped direct to your home. Click on a category below to see the best-rated electric fireplaces. Wall-mount electric fireplaces are great for installing in modern homes that lack an old fireplace. These types of fireplaces are designed to be recessed into the wall for a clean look. Unlike a fireplace insert that you can sometimes install yourself, you’ll need a professional to install almost every wall-mount electric fireplace. This is because you’ll need to cut a hole in the wall to install the fireplace. Additionally, most wall-mount electric fireplaces look better when hard-wired, something that only a licensed pro should handle. One of the most important things to consider when buying a wall-mount electric fireplace is its size. These fireplaces tend to be wider than fireplace inserts with some measuring 70”. The smallest measure around 35” long. Also, you need to check the depth of each unit to get an idea of how much space you need to make in the wall to flush-mount it. Most electric fireplaces have a contemporary design. Often the flames and ember bed are designed with modern/futuristic effects. But you can also find a few with the more traditional yellow flame effects and faux logs. If you are not sure which style is perfect for your home, get a versatile electric fireplace with multiple flame effect settings. Some models also give you the option of using crystals or faux logs for the ember bed. Finally, decide whether you want an electric fireplace with heat or no heat. If you want one with supplemental heat, make sure you find one with adequate heating capacity for the room. 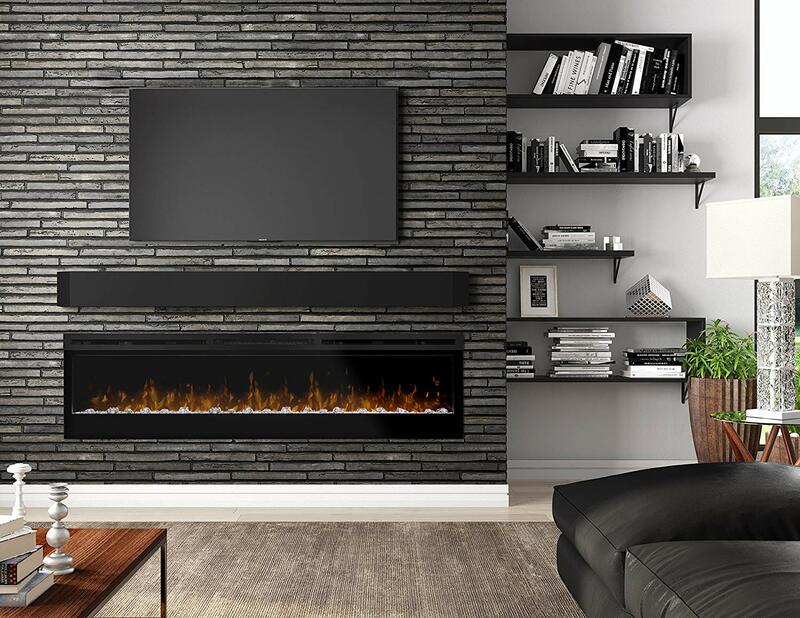 Here are our top picks for wall-mounted electric fireplaces. The Dimplex Prism is a contemporary 50” wall-mount electric fireplace with an integrated fan-forced heater. You can plug it into a standard 120V outlet or get an electrician to hard wire it into a dedicated circuit. You can recess it into the wall such that it sits flush or just hung it if you don’t want to make a hole in the wall (ideal for rented apartments). The design is sleek, modern and minimalist. It looks great however you decide to install it. The black trim and glass front looks especially amazing even with the flame and ember effects turned off. Note: If you want a bigger or smaller wall mount, the Dimplex Prism is also available in 74” and 34” versions. 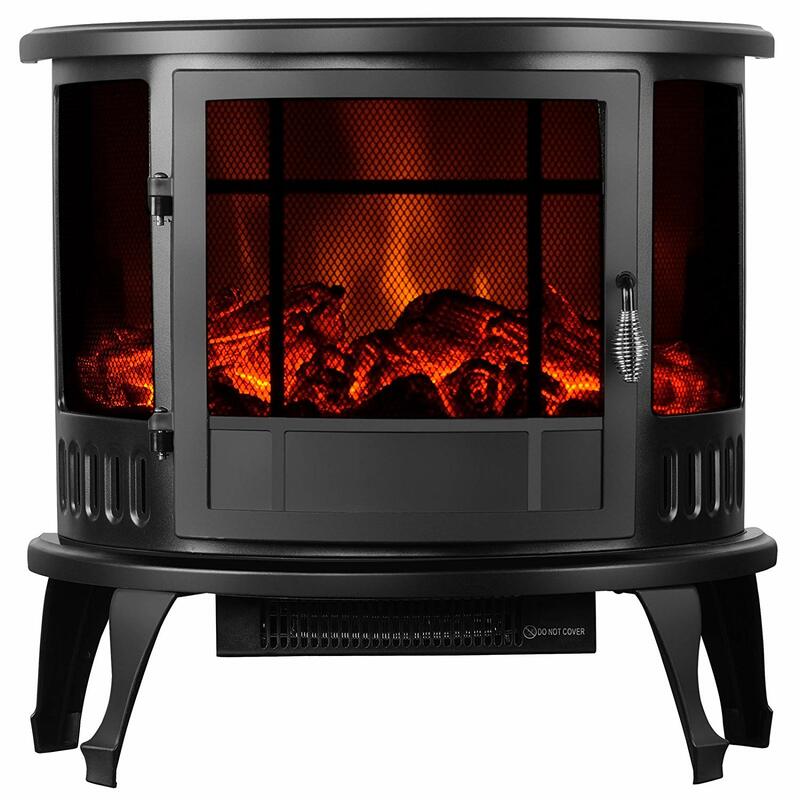 Talking of flame effects, Dimplex uses patented 3D LED technology to create an ultra-realistic look. The flames flicker and dance about like it’s a real fire. It also comes with an acrylic ember bed that sparkles and glows as the diamond-shaped pieces reflect light. If you don’t like the default yellowish flame effects, you can cycle through other color options using the included remote control. You can also change the color of the ember bed. The remote control also lets you change the brightness between L (low) and H (high). As I mentioned, the Dimplex prism comes with supplemental heat. The fan-forced heater has a capacity of 4,198 BTU. That’s about enough for a 400 square feet room. There are three main heat settings: high, low and off. If you want more precise control, use the thermostat + and – buttons to set a specific temperature. Once the heater gets to that temperature, it cycles on and off to maintain it. You can also completely disable the heat function, leaving only the flame effects. The opposite is also possible: turn on the heat function without the flame and ember effects. This lets you enjoy the fireplace through all seasons. Great design and realistic flame effects. Multiple flame and ember effects options. Supplemental heat with versatile settings. Flexible installation options – plugged in/hardwired, wall-mounted/recessed. The heater is only ideal for small and mid-size rooms of up to 400 square feet. 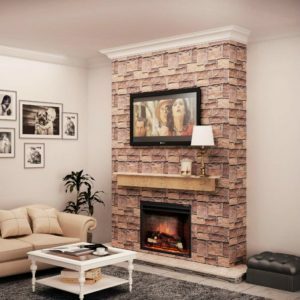 This Touchstone wall-mount electric fireplace is 50” wide (though there are several other sizes available ranging from 36” to 100”) and comes with an integrated heater. The Touchstone fireplace is rated at 120V and draws a maximum current of 12 amps. So you can safely plug it in a standard outlet (but make sure the total draw on the circuit is not too high). But for a cleaner look, I recommend hardwiring it. The best way to install this fireplace is by recessing it into the wall. But if you cannot or don’t want to make a hole in the wall, you can also mount it on the surface. For installation purposes, the fireplace measures 50.4 inches wide, 5.5 inches deep and 21.5 inches high. Which fireplace look do you want? Contemporary or traditional? With the Touchstone fireplace, you can have both. It comes with two options for the ember bed: glass crystals for those who want a cool modern look and faux logs for those who prefer a more traditional style. Many customers preferred the logs. They look very realistic and create a cozy feel. But I recommend trying both to see which one feels and looks best for your home. As for the flames, you have five style options to choose from using the included remote control. You can opt for traditional-style mellow flames that are yellow or switch to a more contemporary blue flame effect and several others in between. You can also change the flame intensity from a raging blaze to a slow-burning fire. 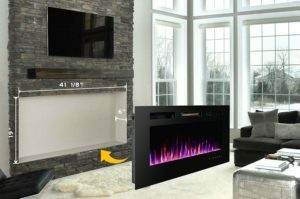 The Touchstone wall-recessed electric fireplace comes with an integrated fan-forced heater. It has a capacity of 5,118 BTUs meaning it is good enough for rooms up to 400 square feet. There are no thermostat settings. You can only choose between high and low heat. If it’s too hot outside, you can turn the heat off completely and just leave the flame effects on. This is great for year-round use. Affordable – comes with plenty of features for a great price. Includes heater for small and mid-size rooms. Year-round use. You can use it with the heat on or off. Versatile installation options – plugged in or hardwired, recessed or mounted, with faux logs or crystals. The heater is ineffective in large rooms. If you are planning to use it in a room bigger than 400 square feet, get it only for the aesthetics. 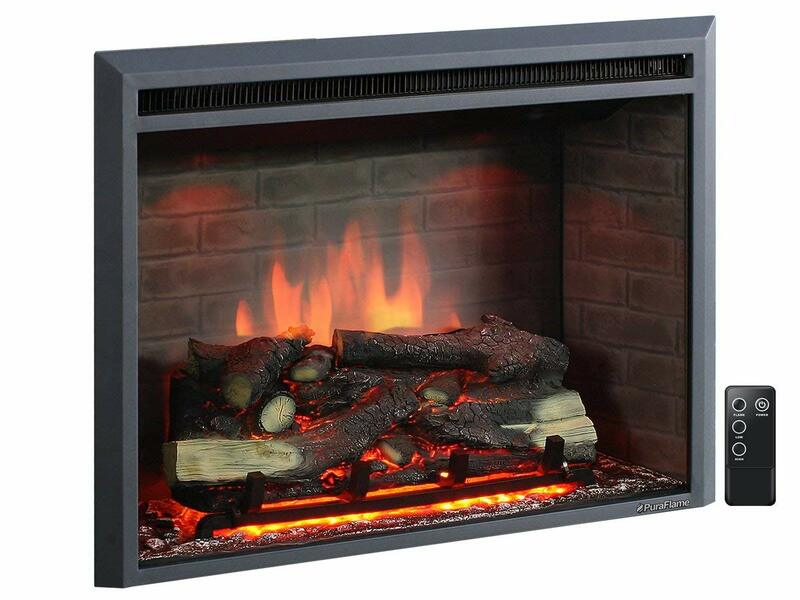 Replace the Elite Flame 50″ Fusion Log Built-in Electric Fireplace which is not available. 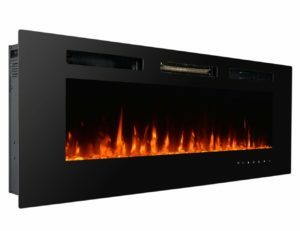 The Napoleon 60” electric fireplace can be recessed into the wall or mounted merely on it. It has a sleek modern design with easy-to-use touchscreen controls. 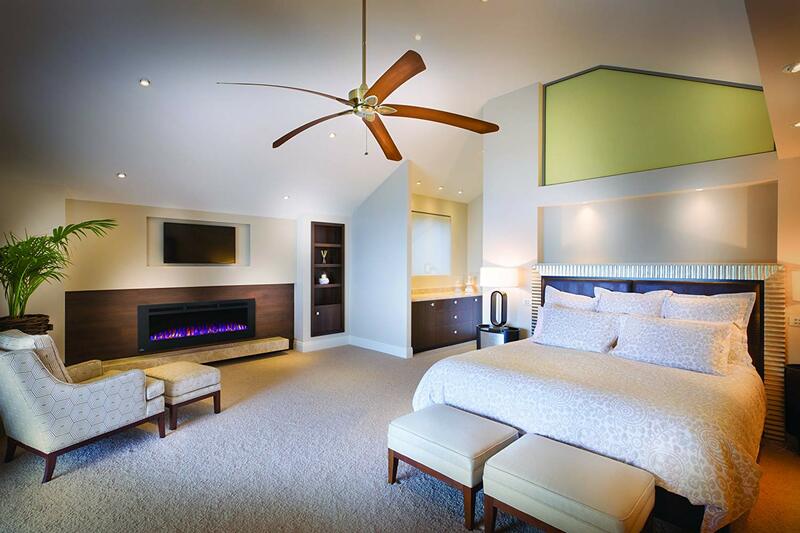 A 5,000 BTU integrated heater provides supplemental heat for rooms of up to 400 square feet. 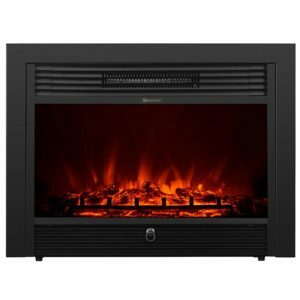 With a 5,000 BTU heater, you don’t need to hardwire the Napoleon electric fireplace. A standard 120V outlet is safe enough. It’s best if it is on a dedicated circuit to avoid overloading. To avoid the messy look of a black wire coming down the wall, the fireplace comes with a paintable cord cover. If you’d rather not have a cord on the wall, you can also get an electrician to hard wire it to a dedicated circuit. The fireplace looks best when recessed into the wall. But there’s no reason you also cannot just mount it on the wall if that’s more convenient for you. With a width of just 5”, it doesn’t jut out awkwardly. It looks just as sleek as a recessed fireplace. Note: There are several other size options available including 32”, 50” and 100”. The ember bed consists of clear cube pieces. They create a more contemporary look compared to faux logs. As for the flames, you have three style options: yellow, blue or a combination of both. All the styles look very realistic. You can also vary flame intensity depending on the mood. All these controls are accessible via the included remote control or the touchscreen controls on the fireplace. The fireplace uses high-intensity LED lights that don’t fade out during the day. So you can enjoy the cozy feel of the flames at any time day and night. The 5,000 BTU heater is only ideal for small and midsize rooms of up to 400 square feet. So if you are planning to install the fireplace in a larger room, get it for the looks not the heat. There are only three settings for temperature: low, med and high. You cannot set a specific figure. If you don’t need the warmth, you can turn off the heat and just leave the flames on. This is handy during warm seasons. Great modern design and realistic flame effects. The heater is not ideal for large rooms. 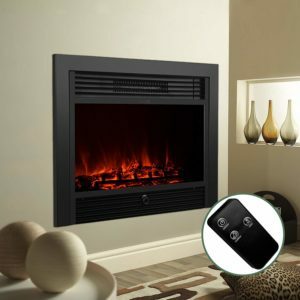 This 50” wall mounted electric fireplace is a good choice if you are looking for something a bit cheaper. You’ll love the sleek modern and the super realistic flame effects. The fan-forced heater provides cozy warmth for small and mid-size rooms. 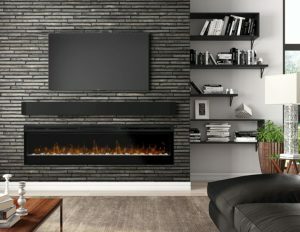 Like all the other wall-mounted electric fireplaces on this list, this one provides two installation options: plug-in or hardwired. It’ll depend on your situation and preferences. If you don’t want a cord running on the wall, hardwiring it is the best choice. If you don’t want to hire a pro, you can surface-mount it and then plug it into the nearest outlet. Whichever you choose, make sure the circuit can handle the current needs. A dedicated circuit is best. The dimensions are 50” L X 4.50” W X 19.20” H.
The 3G Plus fireplace uses crystals in the ember bed which gives it a more modern feel compared to fireplaces that use logs. But if you want a traditional look, you can set the flames to a mellow yellow color. If you’d rather go all the way with the modern styling, there’s also the option of setting the flame color to blue. If you cannot decide between the two, there’s also an effect that combines both colors. The 3G Plus provides two heater options: low and high. The low setting is rated at 750W while the high is rated at 1500W. Both are ideal for small and mid-sized rooms of up to 400 square feet. You can also completely turn off the heater without having to switch off the flame effects as well. This is handy during hot weather when you don’t need any extra warmth. Supplemental heat with independent controls for year-round use. Supplemental heat is adequate for small and medium-sized spaces only. The PuraFlame recessed electric fireplace comes with three flame effect setting, an option between crystals or logs for the ember bed and an integrated fan heater for rooms up to 400 square feet. You can plug it in or hardwire it depending on what you prefer. If you decide to wall-mount it, plugging it in is easier since you don’t have to hire a pro. Use a standard 110/120V outlet on a dedicated circuit. If you decide to recess it into the wall, hardwiring it to a dedicated circuit will provide a cleaner look. The heater vents are at the front, so you don’t have to worry about leaving any clearance at the back or on the sides. The package comes with both crystals and faux logs. It’s up to you which ones you want to use. The crystals create a cool modern style ember bed with a lot of sparkles as they reflect light. The logs are ideal if you want the traditional feel and look of a wood fireplace. You also have a couple of options when it comes to the flames, which look very realistic by the way. You can set them to a cozy yellow effect, mix the yellow with some blue highlights or go full blue for a more modern effect. All these settings are accessible on the remote control as well as the control panel on the fireplace. Similar to the 3G Plus fireplace, the PuraFlame also has two heat levels: a low setting rated at 750W and a high setting rated at 1500W. Both settings can comfortably warm a space up to 400 square feet. As with other heater-integrated fireplaces, you can turn off the heat independently and just leave the flames and embers. This allows comfortable year-round use. For those who love to sleep to the heater’s warmth, there’s an auto switch-off timer for your convenience. You can set it to activate anywhere between 30 minutes and 9 hours. Supplemental heat with separate controls (ideal for year-round use). Realistic flame effects with three options to choose from. Two ember bed options – crystals or faux logs. The heater is only useful in small and mid-size rooms. If you are looking for a traditional style electric fireplace but don’t have an existing fireplace to install an insert, a mantle-style electric fireplace is the best choice. It comes complete with the electric fireplace insert as well as a furniture-grade mantle to complete the cozy traditional look. You don’t have to insert or recess a mantle style fireplace anywhere. It can be set up freestanding anywhere on the floor. It requires a bit of time to assemble the mantel, but it’s something you can do yourself. You don’t have to hire a pro unless you plan to hardwire it into a circuit (most can be plugged into a standard outlet, and it’s easy to hide the cord). When you are shopping for a mantle style fireplace, choose a style that will look great in your home. The mantle is usually made from wood or MDF. Most models will add extra touches such as columns on either side, traditional style trimming, and patterned grooves. Most are finished in a shade of brown, but you can also get white and black ones if you prefer a more modern look. Don’t forget to check the size and make sure it will fit in your home. Most mantel style fireplaces are around 50” wide. But there are also smaller ones that measure 40” wide and extra-large ones that are up to 70” wide. If you are looking for a fireplace with a heater, make sure the heater will cover the room adequately. 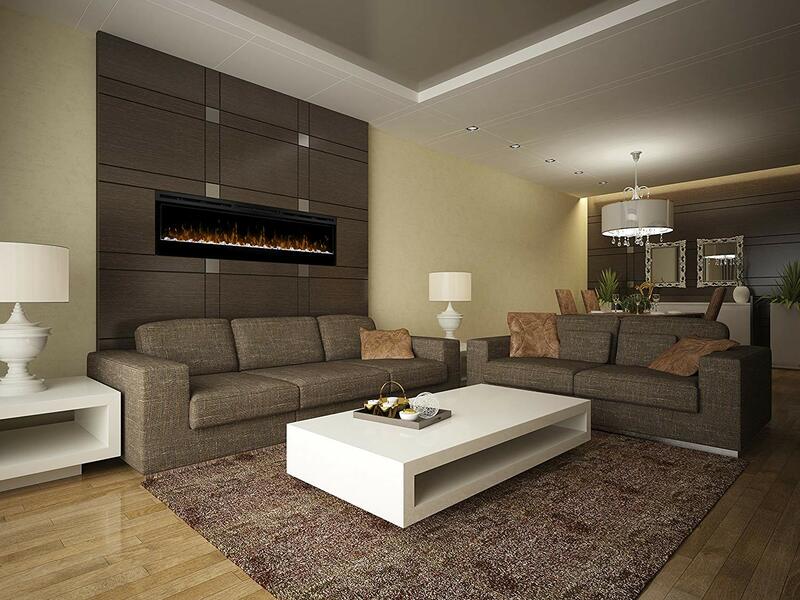 Most electric fireplaces with heaters are only ideal for small and mid-size rooms. As for prices, they range from $400 to $1,500 depending on size, style, features, and heater capacity. Here are the best mantle style fireplaces you can buy online. This is a fairly large (57.6” wide) mantle fireplace that works great as a centerpiece in any room. The whitewash mantel is made from wood and veneered MDF. It has a nice vintage feel. The insert is surrounded by faux blackwash marble that contrasts well with the white mantel. Delicate patterns and details around the mantel give it an authentic look. The insert itself comes with realistic faux logs and vibrant flames. Most of the work is in putting together the mantel. The insert comes already assembled. You’ll just need to insert it into the mantel once you are done assembling the different pieces. Customers say it took them about an hour to finish setting it up. The insert can be safely plugged into a standard 110/120V outlet. You don’t have to worry about hiring a pro to hardwire it. But I recommend using an outlet on a dedicated circuit to avoid any overloads. The flames and embers are incredibly realistic. The faux logs glow just like real logs and the yellow flames dance and flicker about just like in a wood fireplace. There are no flame effect options like color and intensity. The only thing you can change is the brightness using the remote control. The infrared heater works very quietly since it doesn’t use a fan to spread warmth. At 5100 BTUs, it can comfortably warm a space of up to 400 square feet. A programmable thermostat lets you set your preferred temperature. You can also turn off the heat completely and just enjoy the flames. Great design that blends in well in most home decors. 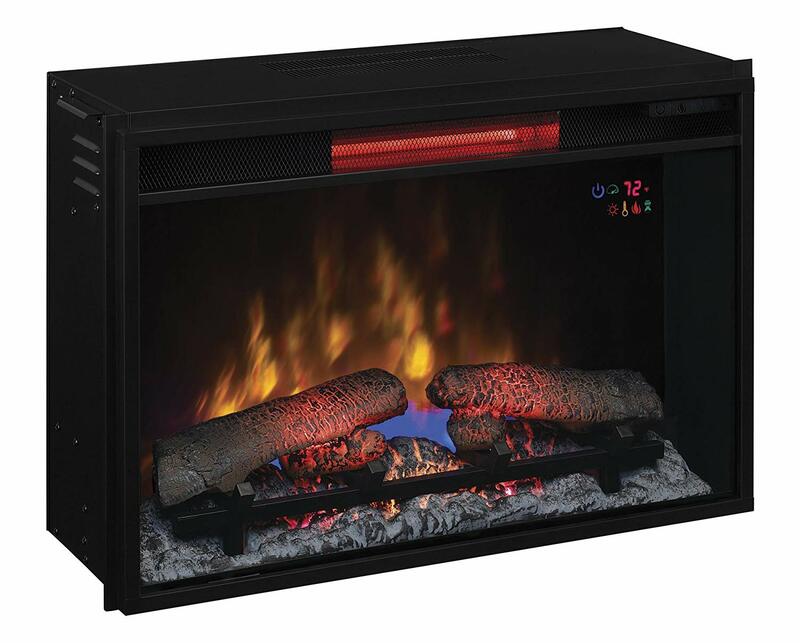 The ultra-quiet infrared heater provides warmth for small and mid-size rooms. Heater not ideal for large rooms. 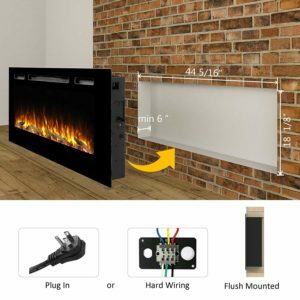 If you are looking for a smaller and cheaper mantel style electric fireplace for your apartment, man cave, basement or home office, this one is a great choice. It’s only 32” wide, making it perfect for smaller rooms. The design looks cozy and homely. The mantel is made from real wood and is finished in a warm brown. The insert comes with a black trim that looks great especially with the vintage-looking vent along the top. The mantle comes in multiple pieces, so you have to assemble it first. But it’s fairly easy. It takes about 30 minutes to 1 hour. It’s a plug-in electric fireplace so no worries about hardwiring it. Just make sure the outlet you plug it into is not on the same circuit with other appliances. This is the one area where the FIREBIRD fireplace could have been better. 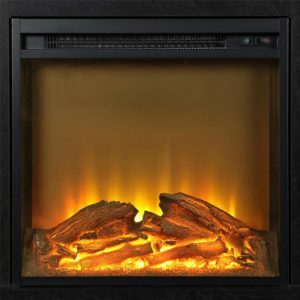 The flames and embers don’t look as realistic as in other more expensive electric fireplaces. Customers say they look too red. This is because the fireplace uses red LEDs to create the flame and ember effects. It’s not terribly bad if you want a warm and cozy faux flame but it can feel a bit synthetic if you are used to more realistic electric fireplaces, or you’ve been using a real wood fireplace. There are no flame effect settings. No brightness, color or intensity. It doesn’t even come with remote control. There are only two switches on the fireplace; one for the flame effects and another for the heat. The 1,400W heater is good enough for rooms of up to 400 square feet. You can turn the heat on/off independently from the flames, but that’s just about it. You cannot set a specific temperature or change heat levels. But it is not that surprising that a lot of these features are missing. 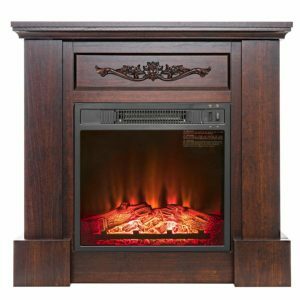 The FIREBIRD is one of the cheapest mantel style electric fireplaces. Beautiful mantel design – made from real wood. Includes a heater for small to medium size rooms. If you are looking for a luxury mantel style fireplace, this one by MagikFlame is a great choice. It’s pricey (goes for around $3,000) but it comes loaded with plenty of features, super realistic flames, crackling sounds and a wide range of flame effect options to choose from. That’s not to mention the handmade mantel which is made from real birch wood and finished in a stylish white color. You can also get the mantel in cherry wood or antique ivory finish. That’s not all. It also has Bluetooth connectivity. Once you download the free companion app and link your phone to the fireplace, you can control most of the features from your smartphone. Despite the price tag, the magic flame is actually very easy to install. There’s no need to hardwire it; just plug it into a standard 110V outlet. The only bit of work involved in assembling the mantle. It should take you about 30 minutes. The insert itself comes ready to use. If you want to control the fireplace from your phone, you’ll need to download the free app (Android only) and then connect your smartphone to the fireplace via Bluetooth. For installation purposes, the fireplace measures 52” wide, 43” high and 15” deep. 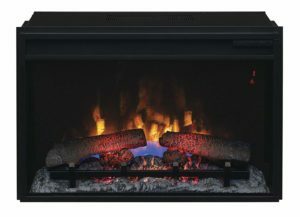 The MagikFlame fireplace uses patented holographic technology and high definition footage of actual burning logs to create an ultra-realistic effect. The faux logs are set in a grate, giving the fireplace a nice traditional feel. With 26 flame options to choose from, this is the most versatile electric fireplace we have ever reviewed. You can set the flame to yellow to simulate a wood fire or select one with blue hints to imitate a gas flame. There’s a style for every occasion and mood. To top it off, the fireplace comes with integrated sounds. The main sound is the crackle of burning logs which is a recording of actual burning logs. You can also select other sound effects including crashing ocean waves, rain, and chirping birds among others. All settings and features are accessible on the remote control, the touchscreen on the fireplace and on the smartphone app. The MagikFlame comes with a 4,600BTU quartz infrared heater which the company says can warm a space of up to 1,200 square feet. But if you want to get really toasty, use it in a smaller room (around 400-600 square feet). Note that you can enjoy the flames with or without the heat for comfortable all-season use. Plenty of premium features including Bluetooth and sound effects. Electric inserts are the most popular types of electric fireplaces. They are designed to be inserted into an existing fireplace with minimal modification. You don’t need to install any fuel lines or ventilation. In most cases, you can install the insert yourself. One of the most important things to look at when choosing an electric fireplace insert is the size. Make sure the dimensions of that particular model line up with the size of your empty fireplace. It’s okay if it is slightly smaller. Most inserts come with trimming to hide any gaps. You can also DIY your own trimming. But it shouldn’t be bigger than the fireplace. Also, check what kind of power setup the fireplace requires. Most inserts with a 1400W or 1500W heater can be plugged in. If the insert has a more powerful heater to cover large spaces, you’ll need to get it hardwired. Regardless of the heater capacity, most homeowners prefer hardwiring because it hides away messy cords. You’ll need to hire a licensed electrician to wire it directly to a dedicated circuit. Finally, consider the aesthetics. Do you want a traditional or modern insert? Would you like to be able to change flame color and intensity? And as with any other type of electric fireplace, make sure the flames and logs look realistic. Here are our most favorite electric fireplace inserts. If you are looking for a compact size fireplace insert, get this one. With a width of 26”, it will fit the smallest fireplaces. You can also insert it into one of the ClassicFlame mantels (sold separately), in a TV stand or even recess it into the wall. It uses traditional-style faux logs set on a grate. There are several flame effect options plus an infrared heater with a thermostat. 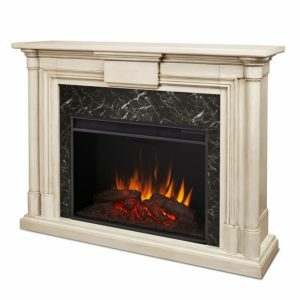 There are several places you can install the ClassicFlame fireplace insert. If you have an existing fireplace, you can insert it there. You can also recess it into the wall or insert it into a cabinet or TV stand. If you decide to recess it into the wall, you may want to order the trim kit as well (sold separately). Whichever option you choose, take measurements before ordering the fireplace to make sure it will fit. 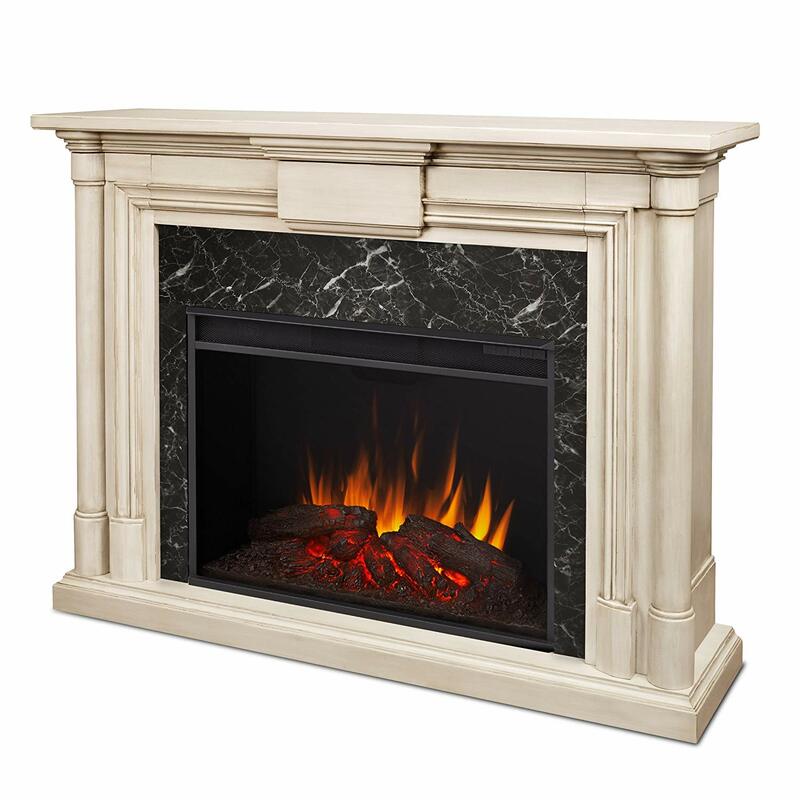 You can also order one of ClassicFlame’s mantels to create a mantle style fireplace. This is handy if you don’t have an existing fireplace and don’t want to recess it into the wall. As for power, this is a plug-in insert. But for aesthetic purposes, you can ask a licensed electrician to hardwire it directly to the circuit. The ClassicFlame insert comes with a versatile range of flame effects to choose from. There are three things you can change: flame speed, flame brightness, and flame color. Each option has five settings. So in total, you have 125 flame effect options. That’s way more than what you get even from expensive brands. All the settings are accessible from the included remote control or the buttons on the control panel. Current settings are displayed on the screen of the fireplace. The insert comes with a 5,200 BTU infrared heater which the company says can heat a space of up to 1,000 feet. Most customers say the heat output is not that strong. If you want to get the most out of the heater, it’s best if you use it in a smaller room (400-600 square feet max). Though it doesn’t feel as toasty as a fan-forced heater, it’s much quieter. This is great if the sound of a whirring fan distracts you from the ambiance of the fireplace. The heater comes with a thermostat so you can set the precise temperature you prefer. It’s also fitted with a Safer Plug which continuously monitors temperature to prevent overheating and fire hazards. The heater works best in small and medium-size rooms. Not ideal for large spaces. This is another great option if you are looking for a fireplace insert that is affordable and has a traditional style. 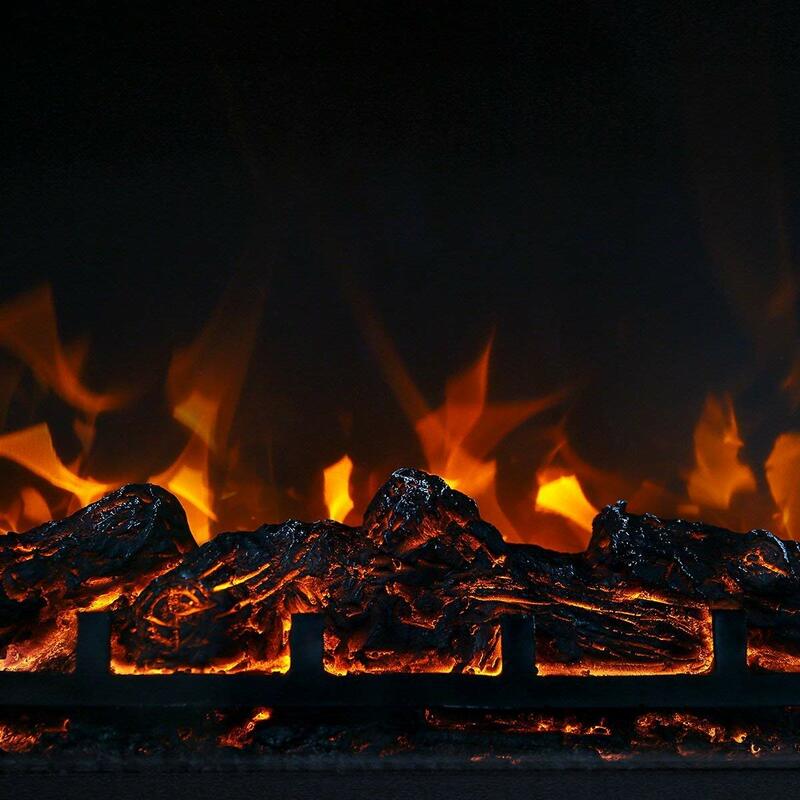 The PuraFlame Western electric fireplace insert uses resin logs to create an incredibly realistic appearance of a real fireplace complete with a grate and faux ember bed. With the integrated heater turned on, it feels like you have an actual fireplace in the room. The only thing missing is the sound of logs burning and crackling. If you want you can hardwire the insert to a dedicated circuit. But since the heater is rated at just 1500W, a standard socket will do. Just make sure the socket is not on a circuit that connects to other appliances. This could cause an overload and blow a fuse. The power cord is quite long (6 feet), so you should have no trouble finding a suitable outlet. As for the insert itself, it’s designed for use in an existing fireplace. But there’s no reason you cannot recess it into cabinetry or mantle as long as there’s enough space. The resin logs look very realistic, burning and glowing like real logs. The effect is heightened by the metal grate and faux ember bed under the logs. The yellowish flames also look very real. There are settings to change flame color, intensity, and brightness. The entire insert has a cozy traditional feel thanks to the black frame on the outside and the faux brick interior. With the flames turned on, it looks just like a real fireplace. The fan-forced heater can be set to one of two heat levels: 750W for gentle warmth and 1500W when you need more warmth. Both are meant for warming spaces of up to 400 square feet. In addition, it comes with a thermostat that has nine heat settings. Once the heater reaches the set temperature, it cycles between on and off to maintain it. Like most heater-integrated fireplace inserts, the PuraFlame Western is equipped with an overheat protection mechanism. Warm traditional design with black exterior and faux brick interior. The heater doesn’t work well in large spaces of more than 400 sq. Ft. 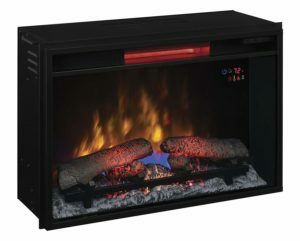 The KUPPET Electric Fireplace is one of the cheapest electric fireplace inserts. So don’t expect a lot of features. But the 3D flames look very real, and it even comes with a heater. You can install this insert in an existing fireplace or recess it into the wall. If you don’t have an old fireplace and also don’t want to make a hole in the wall, you can also just mount it. With a depth of just 5”, it’ll still look great when mounted on the wall. There’s no need to hardwire it directly to a circuit. It’s rated at 1500W max and can be safely plugged into a standard 110V outlet. In case of a power problem that causes it to overheat, there is a built-in mechanism that automatically cuts power to prevent any safety hazards. The flames look very realistic for a low-budget fireplace insert. The company says they used patented 3D flame technology to create realistic flickering and dancing flames. The logs also look real though not as real as those of pricier inserts. There are no flame effect settings at all; not for brightness, intensity or color. But that’s not a surprise considering the price. You get only two heat settings: heat 1 and heat 2. In the first setting, the heater produces heat at 750W. It’s gentle and heats the room slower. In the second setting, the heater goes up to 1500W. The heat output is stronger and heats the room faster. Both settings are ideal only for small and mid-size rooms of up to 400 square feet. Anything beyond that and the blower will struggle to keep the room warm. The fan-forced heater is not as quiet as infrared heaters, but it’s not too noisy either. You won’t hear it hum when you are watching TV. Very affordable – great for those looking for a cheap but good quality insert. Integrated heater with two settings. 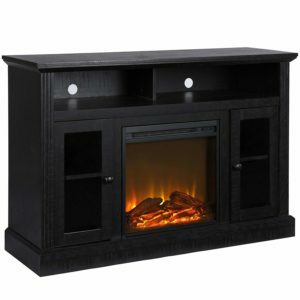 A TV stands electric fireplace is multifunctional in that you can place your TV on it and it also has a recessed space for an electric fireplace insert. When buying a TV stand electric fireplace, first make sure you have enough space in the room for it. Know exactly where you are going to position it, ensuring that everyone can see the TV clearly. Also, check that the power outlet is within reach. Don’t forget to check the features and specs of the insert itself. How realistic are the flames? Can you change the flame effects? Does it come with a heater? Is the heater strong enough for the room? Once you find the right TV stand electric fireplace, remember that you have to assemble it when it arrives. Most come as a flat pack. Assembly is usually not that difficult but can take time. Set aside about an hour to install and set up the entire fireplace. I’d also recommend having someone around to help you. 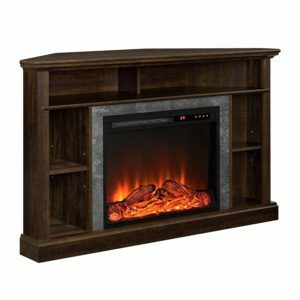 Here are the two best TV stand electric fireplaces we found online. This charming TV stand comes in three colors: black, espresso and natural. When fully assembled, it measures 47” wide, 15” deep and 31” high. The insert itself is much smaller. It measures just 18” wide and fits perfectly into an allotted space between two glass door shelves. It comes with a heater for small and mid-size rooms. The TV stand is great for small apartments, dens, bedrooms and office spaces. As I mentioned, you’ll need about an hour to assemble the entire TV stand. But the process isn’t actually that hard. The instructions are easy to follow, and all the parts are well-labeled. The insert itself requires no assembling. Just slide it into its space and plug it into a standard outlet. When fully assembled, the TV stand feels sturdy. The manufacturer says it can safely hold the weight of a 50” TV. The total weight limit for the top surface is 70lbs. There’s also extra storage space in the two glass-door shelves where you can store books and DVDs as well as an open shelf at the top where you can place your cable box. The fireplace insert uses LED light and faux logs to create the appearance of a real fireplace. It looks very realistic. But there are no settings for flame effects like intensity and color. The fan-forced heater is ideal for spaces up to 400 square feet. But there’s no thermostat or multiple heat levels. If the room gets uncomfortably warm, the only option is to turn off the heater. Using the two switches on the insert, you can turn on the heat or flames separately. This allows you to enjoy the fireplace all through the year. TV stand looks great and feels sturdy. Insert comes with a heater. Separate heat and flame switches for year-round use. No flame effect options, no heat settings, and no remote control. This TV stand Ameriwood Home also makes an electric fireplace. It’s roughly the same size as the Chicago one above with the only differences being design and aesthetics. The insert is 5” wider, making it the better choice for larger rooms. It has an integrated fan-forced heater for spaces up to 400 square feet. There are no color options for the TV stand. It comes in a traditional dark brown finish that the company calls Espresso. The TV stand comes as a flat pack. You’ll need to assemble it. The actual assembly process is not that difficult. The instructions are clear, and all the pieces you need are properly labeled. Nevertheless, it takes about 2 hours to finish assembling the particle board and laminated MDF TV stand. Once you are done, slide the insert into its space and plug it in. The manufacturer recommends placing a max 50” TV on the stand. The max weight limit is 55lbs. There are a couple of open shelves on either side of the insert as well as one at the top where you can put your cable box. The flames and logs are not ultra-realistic like on some premium inserts but they look real enough that your guests will probably think it’s an actual fireplace. But there are no flame options. So hopefully you’ll like what you see since you cannot change it. The 4,700 BTU fan-forced heater is ideal for spaces of up to 400 square feet. Unlike the other model above, this one comes with a thermostat. Once you set your preferred temperature, the heater will maintain it. It also comes with a remote control where you can access all the settings and options. Fairly easy DIY assembly and setup. No flame effect options and no heat settings. One common aspect with all the fireplaces I’ve reviewed above is that they have to be mounted or recessed into a wall, mantle, TV stand or an old fireplace. But there are also free-standing electric fireplaces that don’t need any of that. They can be set up anywhere on the floor and then plugged into an outlet. Most free-standing fireplaces resemble those small cozy stoves you see in RVs and tiny homes. With the realistic flames and logs, they look very similar to real wood-burning stoves. When you are buying a free-standing electric fireplace, make sure you have enough space for it in the room. Measure the size of the space you have available and look for a fireplace that will fit. There are many different styles of free-standing electric fireplaces. Most look like vintage stoves complete with feet and a beautiful metal frame. Compare several styles until you find the one that will look great in the room. Don’t forget to check other essentials like whether there’s a heater, how powerful it is and whether you can change the heater settings and flame effects. Here are two great free-standing electric fireplaces we found online. They both come with a stove-style design and have integrated heaters. This stove-style fireplace will look amazing in any space. The exterior finish is black with nice detailing that adds to its charm. The four feet make it look like an actual stove. The flames and logs look realistic. There is a knob where you can change flame intensity. But there are no settings for flame color. The fireplace comes with a heater for spaces up to 400 square feet and a knob to control the amount of heat produced. One of the big advantages of free-standing electric fireplaces is that there’s no installation involved. Just set it somewhere on the floor and plug it in. 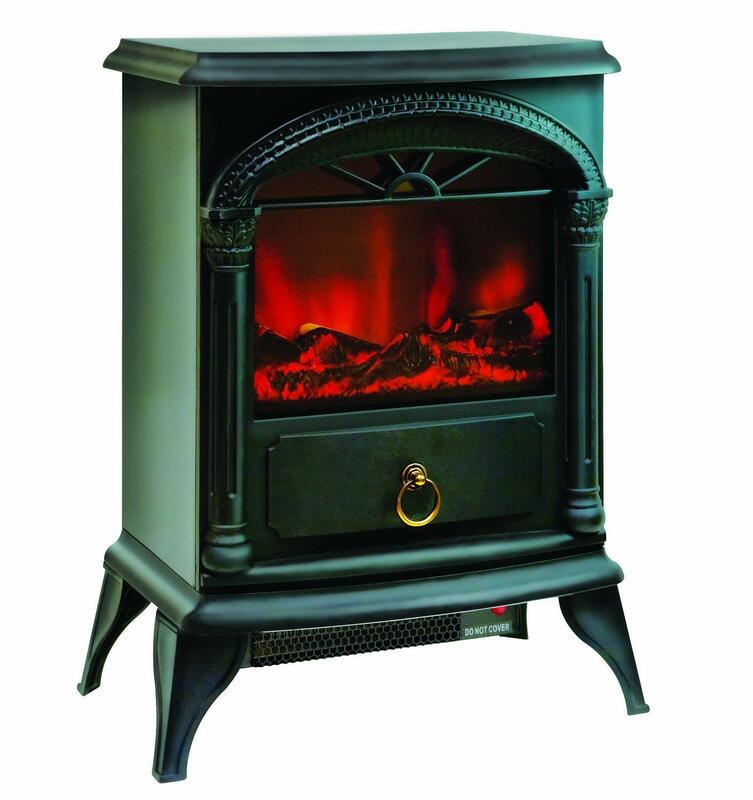 The KUPPET stove fireplace can be plugged into a standard 110/120V outlet. The flames and logs look quite realistic especially when viewed behind the mesh door. The logs glow, and the flames flicker like in a real stove. Using a knob on the fireplace, you can change how intensive the flame is. The fan-forced heater can quickly warm up a space of up to 400 square feet when the heat control knob is set to max. If you need less warmth, simply turn the knob the other way. Note that this electric fireplace doesn’t come with remote control. The only way to control the flame and heat is using the two knobs and switch on the fireplace. Integrated with a heater for rooms of up to 400 square feet. Limited heat and flame settings. This one is more expensive. But it looks amazing. It has a beautiful vintage finish that will blend well with any décor. Stylish touches like the ring handle at the front, the pillars on the sides and the contoured feet add to its cozy and realistic feel. The fireplace also functions as a space heater (400 square feet max), but you can also enjoy the flames without the heat. This is a plug-in electric fireplace. All you need to do is find a suitable place for it in the room and plug it in. Because the surface doesn’t get hot, you can place the fireplace anywhere without worrying that your kids or pet will touch it. The flames and logs look pretty good. But I think the flame could use a bit more blue and yellow hues (it looks a bit too red). There are no flame effect options. The integrated heater is good for spaces up to 400 square feet. It is a fan-forced heater so don’t expect it to be completely silent. But it’s not very noisy either. Just a low hum that’s barely audible over the TV and normal conversation. There two heat settings: 750W for gentle heating and 1500W for added warmth. Integrated heater for spaces up to 400 square feet. 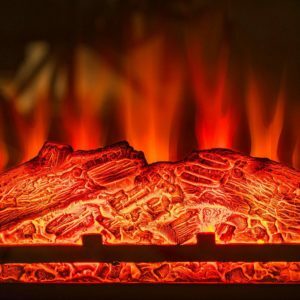 Limited flame and heat settings. An electric fireplace is a device that simulates the look and function of a real fireplace. It uses LED light to create the appearance of flickering flames and glowing logs. While the idea of getting heat from something else other than fire has been around since 1912, the ability to mimic flames was invented more recently in the 80s and 90s by companies like Dimplex. Today’s electric fireplaces combine most of the aspects of real fireplaces to create as realistic an effect as possible. Others go a step further and integrate crackling sounds to simulate the sound of sparks and burning logs. Different brands use different technologies to create fake flames. Most uses LED light. Others use an actual video or animation of a fire burning. The Opti-Myst electric fireplaces by Dimplex use a fine water mist to simulate both flames and smoke. Here are the most common types of electric fireplaces. These are electric fireplaces designed to be installed in an existing empty fireplace. They are ideal for homeowners who have an unused fireplace or want to transition from wood or gas-burning fireplace. These are electric fireplaces that come complete with a mantel. Once you assemble the mantel, you simply insert the fireplace into the allotted space and plug it in. They are great for homeowners without a fireplace and those who don’t want to go to the trouble of recessing a fireplace into the wall. This is an electric fireplace that can be mounted on a wall. Wall mounted electric fireplaces typically have a thin profile and can be plugged into a standard outlet. They are perfect for those who don’t want wall-recessed fireplaces. This is an electric fireplace that doesn’t need any installation or assembly. Just set it up somewhere on the floor and plug it in. Most are designed to look like wood-burning stoves. This is an electric fireplace that is designed to be inserted into a TV stand. The stand is included along with the fireplace insert. Like mantel fireplaces, some assembly is required to set up the TV stand. You then insert the fireplace into the allotted space and plug it in. Easy installation. Electric fireplaces don’t need ventilation or fuel lines. This makes them so much easier and cheaper to install. Most electric fireplaces can be installed without hiring a pro. No pollution.An electric fireplace doesn’t produce any polluting and hazardous emissions. It’s safe for your family’s health, and it’s good for the environment. Minimal maintenance. Electric fireplaces require almost no maintenance. Most uses LED lights which last very long before they need replacements. 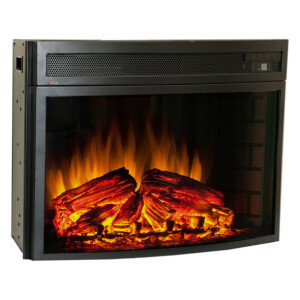 Easy portability.It’s easy to move an electric fireplace to another room or house without having to do any remodeling. They are more energy efficient. Electric fireplaces are more economical to use. Safer for kids and pets. Since there is no actual fire, electric fireplaces are cool to the touch. The only exception is the heater area which can sometimes get hot. Are You Going to Install it Outside or Inside? Most electric fireplaces are designed for indoor use only. If you want to use it outside, look for those that are rated for outdoor use. The manufacturer will most likely specify that it has to be used in a covered area such as the porch. Note that the heater of an electric fireplace will be less effective outdoors. When you take the fireplace outside, turn off the heat and leave only the flames on to save energy. 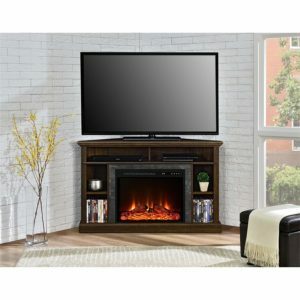 Type of Electric Fireplace: Wall Mount, Insert, Mantle, TV Stand or Freestanding? The best type of electric fireplace will depend on your situation and aesthetic preferences. If you have an old fireplace, an insert is a good choice. If you don’t have an existing fireplace, you can get wall-mounted or wall-recessed electric fireplace. For those who don’t want the fireplace on the wall, a mantle-style or TV stand electric fireplace is a good choice. The best size will also depend on your situation and aesthetic preferences. If you are planning to get an electric fireplace insert, you are limited to those that can fit in your old fireplace. If you are thinking about a TV stand or mantle-style fireplace, you have to consider how much floor space you have in the room. TV stand fireplaces general tend to be the smallest. The TV stand itself could be around 50” wide, but the fireplace is only 18”- 25” wide. 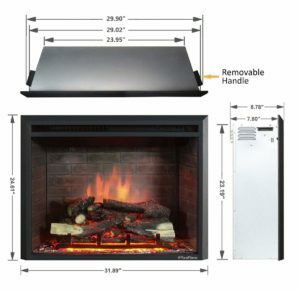 Electric fireplace inserts range between 25” to 50”. Wall mounted electric fireplaces can be as wide as 70”. Most electric fireplaces consist mostly of metal framing and a glass front. A few electric fireplaces use hard plastic. When it comes to power supply, there are two types of electric fireplaces. There are plug-in models, which are the most popular and hardwired models which require professional installation. The type of power supply usually depends on the heater capacity. For fireplaces with heaters for spaces up to 400 square feet, the manufacturer usually recommends plug-in installation. For fireplaces with more powerful heaters that larger rooms of up to 1,000 square feet or more, the manufacturer will often require that they are hardwired to a direct circuit. There are no battery-powered electric fireplaces. At least as far as I know. Style: Modern, Log Style or Traditional? It’s up to you to decide which fireplace style will look great in your home. 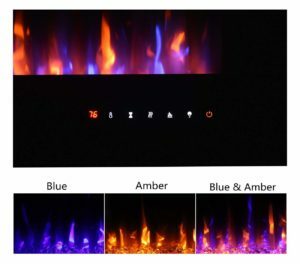 Modern electric fireplaces tend to have a crystal or glass ember bed and bluish flames. Most walls mounted and recessed electric fireplaces have a modern style. Traditional models use faux logs and have yellow flames. Most electric fireplace inserts, mantle-style fireplaces, and TV stand fireplaces have a traditional style. There are also log inserts which consist only of a grate and faux logs. There’s no metal frame or glass front. They have a cozy traditional feel and style. If you want the full fireplace experience – that is, flames + heat – look for a model that has an integrated heater. An electric fireplace with a heater is great for single room heating. It can even save you some energy because you don’t have to use your AC as often when it’s cold. Remember to check the heater output before buying. This will help you determine whether it’s strong enough to warm up the room it will be installed in. Most electric fireplaces have 1500W heaters that can warm spaces of up to 400 square feet. Infrared heaters of the same wattage can warm a slightly bigger space. Higher-wattage heaters can warm rooms of up to 1000 square feet. Another thing to check is whether the heat controls are separate from the flame controls. You should be able to change the temperature and turn the heat on/off separately from the flame effects. This ensures you can enjoy the fireplace all year round. During the warm seasons, you can still enjoy the beautiful flames while leaving the heat off. When it gets cold, you can enjoy both the flames and warmth. You can install most types of electric fireplaces yourself. The only time you’ll need to hire a pro is if the fireplace needs to be hardwired or recessed into the wall. Definitely check what kind of reviews the fireplace has. What do users say about things like assembling the insert, installation, heat output, controls, and flame effects? The remote control is not a must-have, but it’s really convenient. You don’t have to keep getting up from the couch to change a setting or turn the fireplace on/off. It’s especially handy if the fireplace has lots of features and options like flame colors, flame intensity, and thermostat. Electric fireplaces with flame effects are great because you can change the fireplace style on the fly to suit different moods and occasions. Feeling upbeat? Get the flames burning faster and brighter. Want to relax after a long day? Set the flames to a gentle campfire, dim the fireplace brightness and select a relaxing flame color. Different fireplace inserts have different types of effects. For some, you can change the flame color, intensity, and brightness. For others, you can only change one thing like the color. Some budget electric fireplaces don’t offer any flame effect options at all. The standard warranty for most electric fireplaces is one year. A few come with 2 or 3-year warranties. Electric fireplace costs range widely depending on the type, size, and features. The cheapest models cost around $200. They offer only basic features including a heater and realistic flames. Mid-range electric fireplaces offer more features such as thermostat control and flame effect options. On the higher end of the scale are large models (50”+) that come with powerful heaters and a wide range of options. Wall mounted/recessed electric fireplaces tend to be the most expensive while electric fireplace inserts usually cost less. When you are considering how much to spend on an electric fireplace insert, don’t forget to include the cost of installation. Luckily, most electric fireplaces don’t need professional installation. You can install it yourself for free. However, if you are buying an electric fireplace that needs to be recessed into the wall or hardwired to a circuit, you’ll need to hire a pro. Factor the extra costs into your overall budget. Electrical or Construction Permit Required? Electrical and construction permits are rarely required when installing an electric fireplace. This is because installation doesn’t involve major remodeling, gas lines or electrical work. With plug-in electrical fireplaces, you definitely don’t need a permit. With hardwired and recessed fireplaces, you also don’t need a permit in most cases. But check the local building and zoning laws to be sure. Before you install any type of electric fireplace, check the user manual for manufacturer instructions on power requirements. You should only connect the fireplace to an outlet or circuit that can handle the fireplace’s wattage and maximum current draw. First, make sure no water will come in through the chimney. If it doesn’t have a rain cap, install a cover plate. Close and seal the damper to prevent heat loss. Finally, clean out the fireplace in preparation for the new insert. Take measurements of the current fireplace and look for an insert that will fit. When looking for the right insert, there are two kinds of measurements to look at. First, the overall dimensions of the fireplace insert including the trim kit if there’s one. Second, the dimensions of the firebox. The firebox should be the same size or slightly smaller than the fireplace. The trim kit will cover any gaps on the side. If the firebox is too short, you can position it on a platform or raise it using leveling bolts if it has them. If the fireplace is a plug-in, figure out how you are going to connect the cable to an outlet. Some fireplaces have a trap door at the bottom where you can run the cable to an outlet in the basement. You can also ask an electrician to add an outlet inside the fireplace. Another option if you don’t want any messy cables hanging about is to hardwire the insert. This is mandatory for certain inserts that have high-wattage heaters. If you need to hardwire the insert, hire a licensed electrician to do it. With the power supply sorted out, position the insert inside the fireplace, making sure it fits securely. Turn it on and enjoy. When you first turn it on, try out all the features available to make sure they work. If something doesn’t seem right, check the manual’s troubleshooting section or contact customer support. Wall mounted electric fireplaces are fairly easy to install. You just need to secure the fireplace to the wall using the mounting kit provided and then plug it into an outlet. If it needs to be hardwired, you obviously need to get a pro to do it. Installing a wall-recessed electric fireplace is a bit more complicated since you have to cut a space into the wall. If you have some DIY skills and experience, you can do it yourself (except the hardwiring part, if it’s necessary). But I recommend getting a professional to do the entire installation safely and properly. You’ll need to find a non-load bearing wall to cut into, cut out the right sized space from the wall (you may also need to cut away some studs) and then screw the fireplace into the wall. 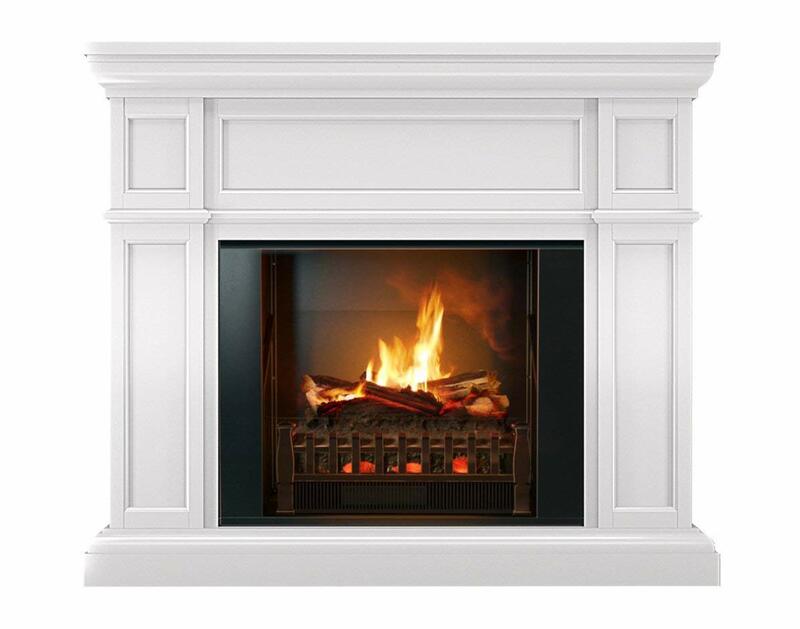 Here’s a video showing how to install a recessed electric fireplace. And here’s another one by Dimplex showing different techniques for installing linear wall recessed electric fireplaces. These are some of the easiest electric fireplaces to install. This is because there’s essentially no installation required. The only bit of work involved in assembling the TV stand or mantel. Most models are plug-in, so you don’t have to worry about getting a pro to hardwire it. One of the main advantages of electric fireplaces is that they are a breeze to maintain. There are only two things you need to do: clean the fireplace regularly and change the bulbs. Before cleaning, first, disconnect the power supply. Then remove the glass front (check the manual for instructions) and use a soft microfiber cloth to wipe down the inside and outside. You may need to remove the fireplace media (faux logs or crystals) before cleaning. You can also use a vacuum attachment to get rid of dust and other debris that has accumulated inside the fireplace. As for the bulbs, most manufacturers recommend changing them every 2-3 years. Make sure you replace the bulbs with manufacturer-approved ones. 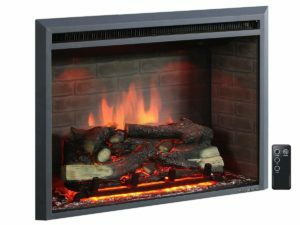 Are electric fireplace heaters energy efficient? Yes, they are. Unlike gas and wood fireplaces that lose a lot of the heat they produce, heaters in electric fireplaces convert most of the electrical power into heat. And since they don’t require a chimney or ventilation, all the heat is directed into the room. How much power does an electric fireplace use? Electric fireplaces are inexpensive to run, whether you leave the heat on or not. With only the flame effects turned on, they cost about $0.02 an hour to run. With heat and flame effects on, they cost about 8-18 cents per hour. The total power usage will depend on how often you use the electric fireplace in heat mode. But even if you turn on the heater every day for a few hours, the overall power usage is still fairly low. Can you use an electric fireplace on the carpet? Yes. Electric fireplaces don’t produce any actual fire. So they are safe for use on any flat and stable surface including rugs and carpets. Can Electric fireplaces have real flames? They simulate the effect of real frames by refracting LED lights. Some models play a high-definition video or animation of a flame. 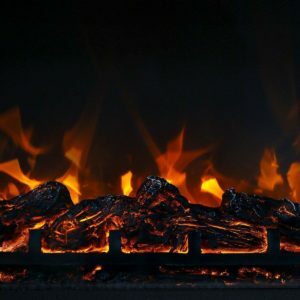 Do electric fireplaces really heat a room? As long as the fireplace has an integrated heater, it can heat a room. Of course, the effectiveness of the heater will depend on the size of the house. That’s why it is important to check heater capacity before buying an electric fireplace. Most heaters are rated at 1500W and can heat rooms of up to 400 square feet. Pricier fireplaces can have more powerful heaters for spaces up to 1,000 square feet or bigger. When installing the fireplace, make sure you don’t block the vent at the front where the heat comes out. Also, check that the fireplace is at the right height and position to ensure the heat is directed towards the main sitting area. Are electric fireplace inserts safe? Electric fireplaces are much safer than wood and gas fireplaces. There’s no pollution or emissions, and the risk of a fire is low. They are also cool to the touch except for the heater vent which you should teach kids not to touch. As with any other electrical gadget, there are some common sense safety tips to follow. One, make sure the outlet or circuit the fireplace is connected to can handle the voltage. If you use an outlet that is on the same circuit as other appliances, it could result in an overload, which is a fire hazard. Two, never use an extension cord or power strip. If you absolutely have to, make sure it adheres to the manufacturer’s power requirements. Three, make sure that any vent, whether it’s for air intake or output, is not blocked. Check the owner’s manual for additional safety instructions. Are infrared heaters cost effective? Compared to fan-forced heaters that use a blower to force heated air around the room, infrared heaters heat only space directly in front of them. There is less heat wasted and hence more energy saved. Which is more efficient between a gas and electric fireplace? An electric fireplace is more efficient. A gas fireplace uses more energy to create the flame and produce heat. An electric fireplace, on the other hand, uses most of its electricity to produce heat and very little to create realistic flame effects. A gas fireplace costs about $350 a year to run. An electric fireplace costs around $50-$120 depending on heater capacity and how often the heater is turned on. Occasions such as Labor Day, Thanksgiving, Black Friday and Christmas are the best times to buy an electric fireplace. Sellers on major retail sites like Amazon as well as in big box stores offer deep discounts. 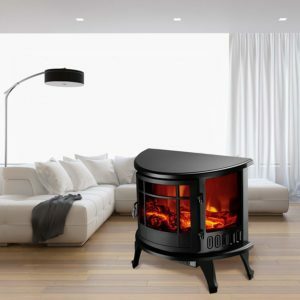 Some brands also offer discounts just before the cold season begins to incentivize customers to buy an electric fireplace in preparation for the chill. Most discounts are modest – 10-20% off – but on special occasions like Black Friday you can get up to 50% off. You can get an electric fireplace online, your local big box retailer or at a local furniture specialist. Furniture specialists tend to be the most expensive. But they can be very helpful in helping you find the best electric fireplace for your needs. Some also offer complimentary installation. Big box retailers are cheaper, and you can get a wider variety of electric fireplaces. The downside is that there may not be a specialist who can help you find exactly what you are looking for. You also have to set aside several hours to go to the store, choose an electric fireplace and transport it back home. Buying online has many advantages. For one, there is a huge variety of electric fireplace to choose from. The prices are also usually the cheapest online. You can get a better deal than either a big box store or furniture specialist. Finally, the fireplace is delivered right to your doorstep.